Pushing the reset button. The history of epilepsy genetics can broadly be distinguished into two major eras: the time before September 4th, 2012 and everything after this. September 4th, 2012 was the date that the first large genome-wide association study in IGE/GGE was published online in Human Molecular Genetics. Each of the >100 association studies in IGE listed in PubMed is now dated and needs to measure up against the current study, which will likely be remembered as the “EPICURE study”. The results of the EPICURE study are surprising and upset our conventional wisdom of what causes one of the most common forms of epilepsy. All genes are created equal. Let’s push the proverbial reset button and hypothesize that we do not know anything about Idiopathic Generalized Epilepsy, one of the most common forms of epilepsy. One possibility to identify some basic mechanisms of this disease would then be a genome-wide association study (GWAS). A GWAS looks at hundreds of thousands if not millions of common genetic markers across the genome and tries to identify those markers that show an association with disease. The markers are pre-defined common variants called Single Nucleotide Polymorphisms (SNPs). GWAS are very cruel studies as they are unbiased and apply extremely stringent criteria. Everything we know or think we know does not matter in a GWAS: statistical significance is all that matters. As an upside, GWAS methodology is well established, and once a marker survives the stringent GWAS analysis, there is little doubt that this marker is disease-related. For many diseases, GWAS was the first possibility to identify any molecular mechanisms and genetic risk factors at all. Where did all the ion channels go? The EPICURE study including 3000 patients with IGE/GGE and 4000 controls finds two variants associated with IGE. The first variant on chromosome 2p16.1 is close to VRK2, a gene coding for vaccinia related kinase 2, a gene of unknown function, which was recently found to be associated with schizophrenia. The second variant on chromosome 17q21.32 is close to PNPO, the gene coding for pyridoxine-5’-phosphate oxidase, the causative gene for pyridoxal phosphate dependent epilepsy, a severe and very rare metabolic epilepsy. Before engaging in lively discussions on how variants in these genes might contribute to IGE, let’s stop for a second and discuss the genes that “did not make it”, but that we all expected to show up in an IGE/GGE GWAS: ion channel genes. In fact, except for common variants in SCN1A identified in a secondary analysis (see below), there is little evidence that variants in ion channel genes have anything to do with IGE. The GWAS curse. To put things in a broader context, GWAS rarely find variants that researchers expect in a given disease. In a way, GWAS are not supposed to do this, as we are looking for additional knowledge through hypothesis-free investigations. But GWAS do have their limitations. For example, common variants in ion channel genes might contribute individually little to IGE/GGE, but might be very important collectively. There are existing methods to assess these hypotheses, and the EPICURE sample would be sufficiently large for this. As with many screening tests, not finding a given gene in a GWAS does not mean that this gene or gene family is irrelevant. It simply means that it was not identified through this study and methodology. In addition, GWAS do not identify genes, but markers within or next to genes. Many common variants in the human genome are linked and come as blocks or chunks (Linkage Disequilibrium or LD). Association studies cannot distinguish between the genes within these blocks. The SCN1A story. The EPICURE GWAS explored several side stories as a secondary analysis. Secondary analyses are always hypothesis-driven and need to be put into context, as they do not apply the stringent criteria of the main study. Within a sub-syndrome specific analysis for absence vs. myoclonic epilepsies, several additional risk variants were identified that deserve further attention. 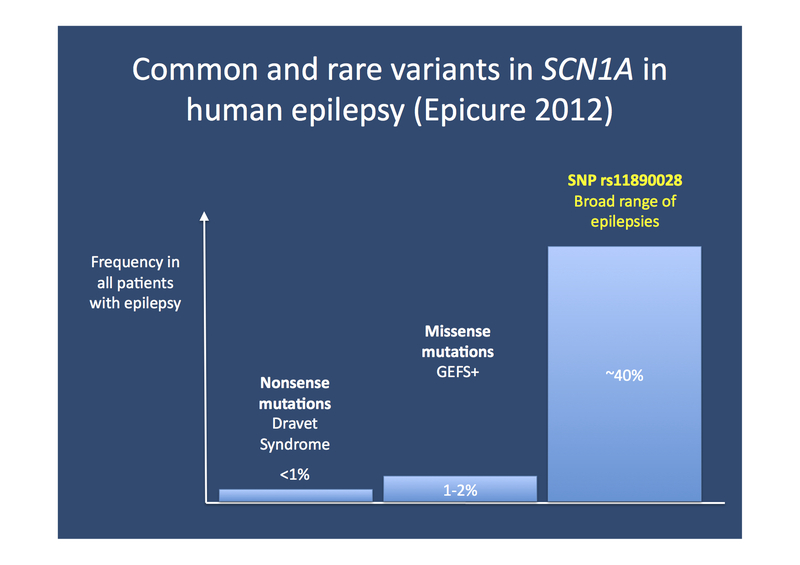 In addition, the researchers looked at variants in SCN1A, the prime candidate gene for epilepsy. In conjunction with a recently published GWAS in focal epilepsy, the SNP rs11890028 showed genome-wide significance. This finding is a nice example of how additional information can be obtained through meta-analysis, i.e. the joining of multiple association studies. In addition, variants in SCN1A seem to confer risk to various kinds of epilepsy along the spectrum of frequent and rare variants. Rare pathogenic variants result in Dravet Syndrome or Genetic Epilepsy with Febrile Seizures Plus (GEFS+), while common variants predispose to a wide range of epilepsy syndromes. Also, this observation demonstrates that despite the size of the EPICURE study, there might still be associations hidden beneath the surface that appear when extending the study. In defense of common variants. The recent EPICURE GWAS identified an intergenic variant in proximity of SCN1A as a common risk factor for a wide range of epilepsies. Even though rare, highly penetrant variants in SCN1A causing Dravet Syndrome receive most of the attention, common variants have a strong impact on the population level. Despite the fact that common variants are also present in a large proportion of unaffected individuals, the population-attributable risk of common risk factors is probably higher than the cumulative impact of all mutations causing Dravet Syndrome or GEFS+. Next Gen instead? Over the last two years, there has been wide-spread skepticism regarding GWAS. With the advent of high throughput sequencing technologies, GWAS even appeared to be obsolete at some point. However, there seems to be a shift in opinion again. Massive parallel sequencing or Next Generation Sequencing uncovers a plethora of rare variants with unknown significance, and the algorithms to distinguish pathogenic variation from genomic noise remarkably resemble the statistical methods in GWAS. Taking into account that a recent study failed to identify causative rare variants in IGE/GGE, the GWAS is far from over. The EPICURE data is currently joined with other IGE association studies in an effort sponsored by the International League Against Epilepsy (ILAE) and we are anxious to see the results. The next steps ahead. The EPICURE GWAS has resulted in two IGE risk variants that require further investigation. This study is a clear mandate to the research community to probe these variants further, to identify the risk genes in the 2p16 and 17q21 regions and to investigate their role in IGE/GGE. The existing association finding with VRK in schizophrenia is reminiscent of the findings in epilepsy-related microdeletions, hinting at shared genetic risk factors to a broad range of neurodevelopmental disorders. In contrast, PNPO as a candidate gene is both unexpected and puzzling. Pyridoxal phosphate dependent seizures have little in common with IGE/GGE and this finding might hint at mechanisms that are yet to be discovered. A community effort. The first two authors of the EPICURE study are consortia, not actual people. Both EPICURE and EMINet are consortia well past their funding period, demonstrating the length and complexity of investigations that eventually result in large-scale studies. The IGE/GGE GWAS is the largest community effort in the field so far, demonstrating that the future of epilepsy genetics will depend on collaboration, data sharing and joint publications. On a personal level, the EPICURE GWAS has virtually accompanied my entire career in epilepsy genetics from 2005 until today. Therefore, I feel deeply attached to this study. It feels good to see this monumental study published. This entry was posted in 2012, IGE/GGE, Opinion, Papers and tagged Childhood Absence Epilepsy, EPICURE, genetic risk factors, GGE, GWAS, human molecular genetics, Idiopathic Generalized Epilepsy, IGE, juvenile myoclonic epilepsy, PNPO, VRK. Bookmark the permalink.